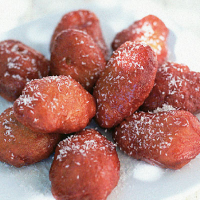 These spicy potato doughnuts are a delicacy eaten on Sunday mornings – young children walk around the neighbourhood with baskets selling these sugary treats. This recipe is like one for Dutch koeksisters, which are drenched in syrup and are sweeter than the Cape Malay versions. Simmer the potatoes in water for 10 minutes until tender. Drain well and mash with the milk, butter, egg and 2 tbsp vegetable oil until smooth. Allow to cool slightly. Place the yeast, sugar, flour, salt and all the spices in a large mixing bowl. Mix in the potato mixture, turn out onto a surface and knead to a smooth dough. Return the dough to the bowl, cover with clingfilm and leave to rise in a warm place for about 1–11/2 hours until doubled in volume. Knock back and roll out on a well-floured surface. Cut the dough into 25 rectangles (about 2.5cm x 5cm), space out and allow to stand for 15 minutes. Meanwhile, make the syrup by putting all the ingredients in a saucepan with 250ml water; simmer until the sugar dissolves. Then boil for 10 minutes until the liquid coats the back of the spoon. Fill a saucepan a third full with the oil and heat to 180C or until a small cube of bread turns golden in 5 seconds. Fry the doughnuts in batches of 6 for 5–6 minutes until golden brown. Remove with a slotted spoon and drain on kitchen towel. Dip each koeksister in the syrup and sprinkle with the coconut. Serve warm. Coffee and doughnuts make a classic combination the world over.